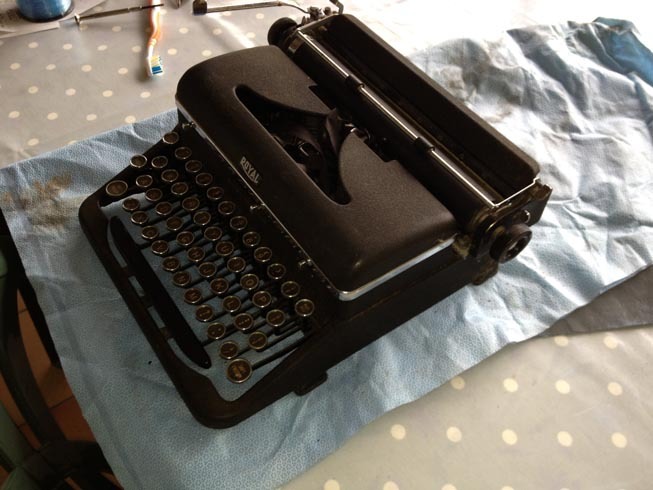 Last week some of you may recall my blog about buying a typewriter explicitly for the purpose of keeping it away from the hands of key-choppers. And that I collected it on friday, the same day I excitedly took delivery of a Hermes 3000. Well I spent a little time this afternoon assessing, cleaning and fixing the Royal. I have been calling this typewriter my ‘folly’ for the past week, and even referred to it as the dark side of the Yin-Yang formed by my white Hermes. But I no longer believe this to be a fair comment on this typewriter. Indeed, closely examining this typewriter has led me to believe that this machine has quite a tale to tell. So grab a beer, settle into a comfortable chair, and let me weave you a story. My part of this story is only a brief moment, so far, in the life of this typewriter. I collected it on friday afternoon after several conversations with the owner. Originally the owner had organised for me to collect this machine on Friday from her parents house. But that soon changed, and the arrangements became increasingly difficult. At first the collection times became vague, and then they were pushing to have me collect the typewriter from her ex-husband. The ex lived in the same suburb as me, so it seemed a logical choice. But they were suggesting a time specifically on friday afternoon, indicating that they were probably leaving the typewriter with them during a child custardy exchange. As the two lived 80 kilometres apart, this seemed near certainly to be the case. Arriving at or around such an emotional point in time, to me, didn’t appear to be the best option. There were too many variables. Too many issues that could complicate things, and frankly I can do with a little less complication in my life, and I expressed that I didn’t intend to to business this way. Eventually we met in my home suburb, but at a set of shops near her ex husbands house. Unfortunately, I had suffered the ill effects of some dodgy italian salad from the celebratory dinner the night before, and when the seller was 35 minutes late, I was also running 35 minutes late for a visit to the toilet. The seller drove a late model Holden Commodore. The kind that has extra bits of plastic bolted all over it to indicate that it’s ‘really, really fully sick fast maaaaate’. The holden badges had been swapped with Chevy badges, and there was a southern cross sticker on the back window. The seller, a woman had big dark sunglasses on, and arms covered in reasonably fresh tattoos. “Oh f*ck” I moaned to myself, before judgementally thinking “Bogans, f*cking bogans”. The seller’s shy young son jumped out of the car and opened the boot. The typewriter was buried under a mountain of trash novelties filling the boot, and it took a minute or so of relocating suitcases and pool toys before the typewriter emerged. I was genuinely shocked by the poor condition of the case. I had never seen something in such a poor state, being sold on eBay. And I had bought it… sight unseen. No wonder they were expecting to sell this thing as merely Jewellery materials. 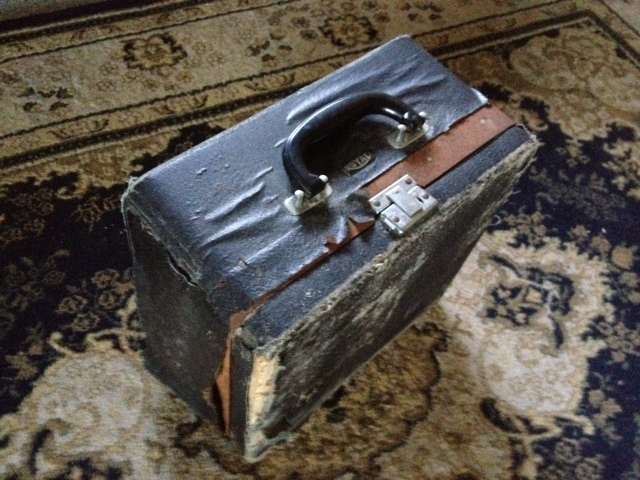 I only opened the case for long enough to check that there was actually a typewriter in there. I handed the boy an envelope filled with cash. I grabbed the case and dropped it into the back of my car, giving the seller a smile as she reversed her Commodore away from me, and drove off. The whole thing took 1 minute, 20 seconds. The one minute being the time taken to find the buried typewriter. And then I was alone… with my folly. I arrived home to find the Hermes 3000 on my doorstep. I grabbed the Royal out of the boot of my car and carried it upstairs with the Hermes in the other hand. They royal sat on the floor of my office for a few days till I could find time and enthusiasm to get to it. I didn’t know what to expect. I could open it and find a hundred cigarette butts might fall out. I could touch it and find it suddenly collapse into a pile of ashen powder, its soul wafting up into a tiny cloud of smoke. This morning I cleared aside the Remington noiseless that I’m at a temporary stand-still repairing, and put the Royal onto my back deck table. I cracked open the case, which held mostly rigid while threatening to fall apart at any moment, and looked at the machine inside. I couldn’t detect any serious corrosion on it, but there was a fair amount of dirt and fluff immediately visible. Pulled it out of it’s case, which protested with a crunch as the top of the lid popped aside before I then placed the typewriter on the table. The entire unit was filled with a layer of dirt and filth which coated almost every face of this typewriter. Even the keys have a fine film of silt behind their glass faces. The words ‘Built in the British Empire’ are printed across the front in gold text, and the ribbon was wrapped around the typewriter. But at least it had its original spools. All the type bars moved freely. The carriage moved when pressed by hand, and so I set about cleaning the unit and replacing the carriage drive belt/string. After about 2 hours I had a lot of the muck off this unit, and a new line in the carriage. I tapped the space bar and the whole unit lurched into life in near perfect operation. Every type bar shifted in the segment without a hitch, the carriage shuddered mostly without skipping, and it looked like this unit was about to live its second life. But what about its first? 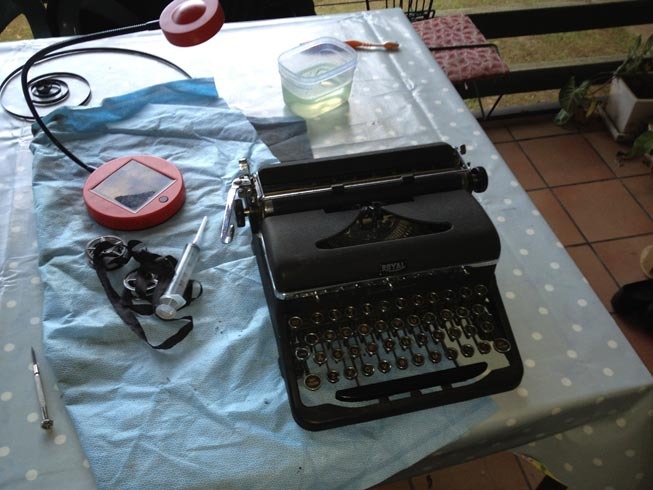 There must have been quite a lot history behind this typewriter before it ended up in the boot of a family race-car. I went for a walk before I plopped in a new ribbon, and had a bit of a think about things. I wandered down by the river, and saw the row of flood warped trees lining the riverbank when it suddenly occurred to me what has happened to this typewriter to end up in such a state. So let’s step back in time for a bit. Nothing here is certified fact, and I may have made some assumptions which someone may prove untrue. So don’t hang me for this. First stop in history, is the birth of this typewriter in 1938/39. The ‘Built in the British Empire’ across the front could mean anything. But like my Remington 16, which has the remnant of a ‘built in Australia’ sticker on it, I suspect this is a machine that was put together out of parts brought from the USA, under a tax regime designed to stimulate manufacturing employment grown during the great depression. Most likely in Scotland. But this is only an assumption (typosphere? What’ve you got). This typewriter was born in the abject poverty of a faltering empire, on the cusp of an era that would be dominated by a ferocious war that would see tens of millions lose their lives, and hundreds of millions displaced and looking for new homes across europe, the UK and the soviet union. At some stage this typewriter has probably migrated across to Australia with someone in search of a better life, arriving most likely in one of our southern states, before looking for work in the agricultural boom of Queensland. Fast forward to 10th January 2011. I’d been in my new job for only 2 weeks, and I was frantically calling patients and hospitals all over Queensland trying to get supplies to critically ill patients in remote areas that had been flooded. The day before the 10th I had been up the sunshine coast (coastal area north of Brisbane), grinding my Nissan 4×4 through creek crossings where there hadn’t been creeks before. The highway to Gympie had been shut off, but one of our patients had been evacuated to a refuge centre just south of the city. 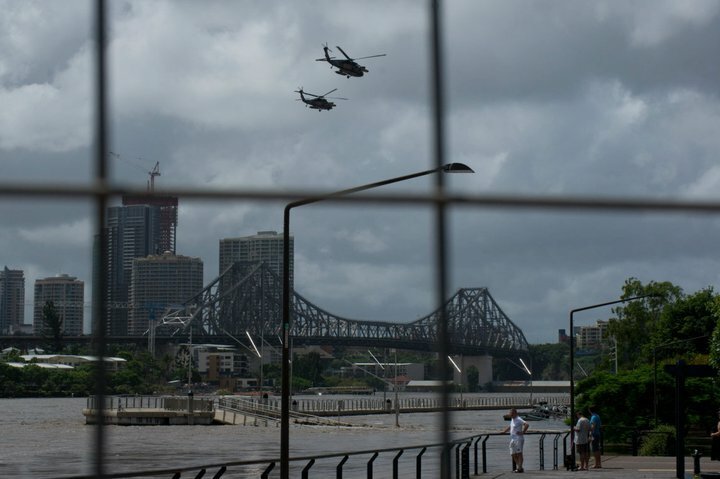 Brisbane had been guaranteed by previous mayors and politicians that there wouldn’t be a repeat of the floods that crippled the city in 1974, due to the massive construction of the flood-mitigating Wivenhoe dam. We all felt safe. But today there was a feeling of impending doom in my office, as my calls had gone from dealing with flood-trapped people in far away and remotes parts of Queensland, to regions closer and closer to home. By 1pm I had patients 5 kilometres away from the hospital telling me that they couldn’t come and collect their supplies as they were already flooded in. As I drove home on the Sunday, the 9th of Jan, much of the farmland around the Sunshine Coast looked like an ocean. The rain was so strong for the 100+ Km drive that I often had trouble keeping sight of the road. By Monday I was almost a wreak myself emotionally. I’m unsure where this typewriter may have been kept at the time, but I almost certain that the severe damaged caused to the case, and the silt like coating of much across the entire machine, was an indication that this typewriter probably spend a lot of it’s time submerged in floodwaters in of a house or storage unit somewhere in either the Sunshine coast, or in Brisbane where the seller and her family had lived at the time. This machine, is a survivor. Plain and simple. Many other of its like would have been piled up into a skip and sent to one of the rubbish disposal centres around Queensland, post flood cleanup. The fact that it is here today is almost a miracle on its own. In January 2011 I was living in the suburb of New Farm, Brisbane. My sister called me late on the 10th after seeing the devastation in Toowoomba, Grantham and Murphy’s creek on the news on the TV. I assured here that there wasn’t going to be a flood in Brisbane, and we would be fine. Hours later we learned that one of our Neighbour’s parents were missing. They lived in Grantham, and effectively the whole town had been smashed and scattered across the fields by a wall of water that had come down from the mountain range near by. The next morning I learned that one of my patients were missing from Murphy’s creek. Another patient needed to be air-lifted to our hospital for critical, but routine care. I worked frantically to do as much as I could. My boss was on the phone working through the air-lift of the patient and their needs. I bundled up replacement equipment for the patient in Murphy’s creek, and started to organise army assistance to get it to them, if they turned up at an evacuation centre. My boss got the first call about what was happening in the world outside our offices, about what was about to happen to our lives. Her neighbourhood had already flooded out, and she was going to have to camp in the office for a few days till the water cleared. Her home was far above water and safe, just unreachable. She however lived much further out from the city than I did. Later on I got news that the power was about to be cut to my neighbourhood to protect infrastructure. The politicians were now openly talking about brisbane being affected by catastrophic floods and that we all should prepare. My home never did flood out. We were quite safe, but I was one of only 20% of the people that continued to work in our hospital during the period around and during the floods. And I did so at a fair personal cost. I only lived a few Kilometres from the hospital, but between my home and work, there was only 1 road left open off the peninsula. And this was filled with tourists that had come down to check out the damage, and the flooding in the area. My suburb was actually quite above the level that the water reached during the floods, but most of the damage was done by the pressure of the swollen river pushing back against the sewerage, gushing putrified material into a massive waist-high lake that filled our neighbourhood. The smell was indescribable. Helicopters ferrying food, and army personnel to crucial areas started flight at about 4:30 in the morning, and typically didn’t finish till about 9 at night. Television helicopters also spent hours circling my suburb. The violent rush of the river sounded like a hundred freight trains forever riding past my front door, 24 hours a day. My phone only held so much power, so I charged it whenever I got to work. I stopped answering calls, and instead started to regularly update family via Facebook. Either with hourly status updates, or photos taken straight from my phone about the situation developing around me. In this case, Facebook was an amazing help to me, as I could keep a large group of friends and family up to date constantly, without being stuck talking to people during panicked phone calls. Cleaning up under a house, a block and a half away from my home. I still have the boots that I wore to help with the cleanup after the floods. I could have cleaned off the paint that splashed onto them from an exploding paint can, but I haven’t. So Sure, this typewriter has problems. But it works. Mostly. There’s problems with it that need fixing, and I’m still uncertain about it’s identity and it’s year of manufacture. But I think this typewriter has gone through a lot of dark times in people’s personal histories, yet it lives on. Now able to type another day. I’ll give it a bit more of a clean, and see if I can sort out some of the smaller problems that remain (quite possibly achievable with just cleaning and oiling). And then…. I’m not sure what I’m going to do with it. But I do think it is deserving of being given a new life. Don’t you? 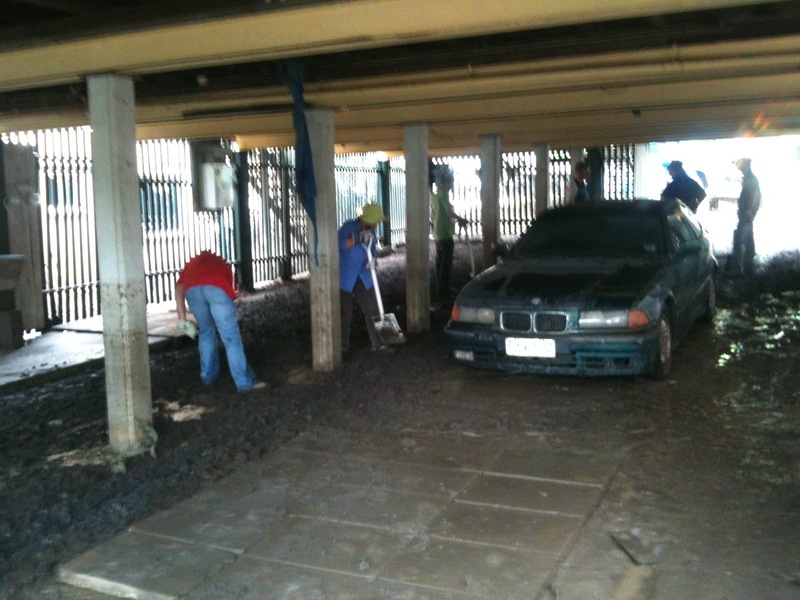 May 20, 2012 in arrow, brisbane, floods, home, hospital, repair, royal, typewriter, work. A fascinating story of a saved typewriter and the tragic events of Australia's major flood! I am very glad that you persevered with the pickup of the Royal and then performing the necessary clean-up and repairs. 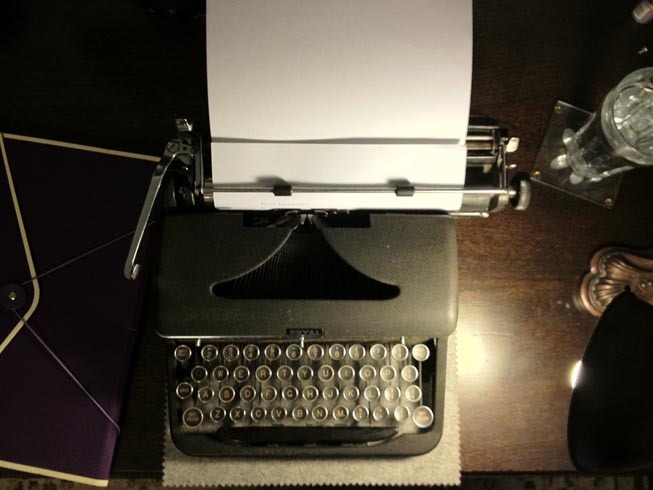 It seems like an excellent typewriter, well-worth saving. Fantastic stories. I'm happy to hear this machine got a caring home after all it's gone through. That's a lot of history, for sure. I'm glad that the machine is now in good hands. I can't imagine a laptop going through that and coming through to a second life. Thanks for the right up, Scott.